The story is about a good shepherd who, every year in the few autumn weeks and winter days before Christmas, goes up on the mountains. This shepherd named Benedikt does not travel alone. Together with his dog Leo and his buck Knoest he sets off to the smaller roads and paths that lead to the top of the mountain. Every year herds of sheep are living on the mountain from spring until the end of autumn. Every shepherd has to look for his herd and bring them safe home in the valley before winter starts and it will be nearly too late to travel on the mountain to get home with the sheep. Benedikt does not have his own herd of sheep. But together with Leo and Knoest he tries to bring every sheep safe back home. He helps the other farmers and shepherds who in fact too late. That something like this happens makes it a very dangerous expedition for Benedikt and his friends. Leo has as a dog a keen sense of smell and can locate the sheep way earlier than the eyes of Benedikt in a winter storm can see. Knoest has also his specialty. When a sheep is stubborn, Knoest knows how to deal with it so the sheep does follow the shepherd Benedikt who leads them all … hopefully … back home. 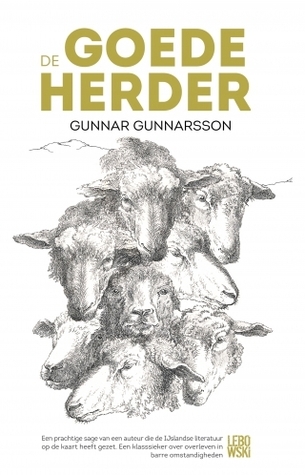 This book is translated from Danish though Gunnar Gunnarsson is Icelandic. I did not discover any grammar or spelling mistakes in the Dutch version but I can not read Danish nor Icelandic. I hope you like the book too. It is worth to read this short story! You have to read the book yourself and make your own opinion.